Summer is gone. The air has changed bringing that tinge of frost to darker mornings and earlier nights. In the city, we judge how far into the season we are by the bend of wilted perennials and the gradations of leafy colour quickening along the avenues. Nature seems to keep pace with the rhythm of the urban environment, never stopping to take a breath or ease into the season but leaping headlong in some frenetic rush to finish autumn before the snows come. The romantic in us longs to be out in the country, tromping about in big boots and woolly scarves, kicking around the edge of new-mown fields or just sitting on a fence taking in the glory of it all but we must content ourselves with more virtual views for the moment. October reminds us it is time to make sure we are set for the duration, to check that all the plans we laid in spring, all the projects dreamed about on sunny afternoons and languid August nights, are in place and ready to be realized. It is as much about reflecting on what has been accomplished as it is to looking forward in hope, setting larger goals and taking the first steps towards the new. 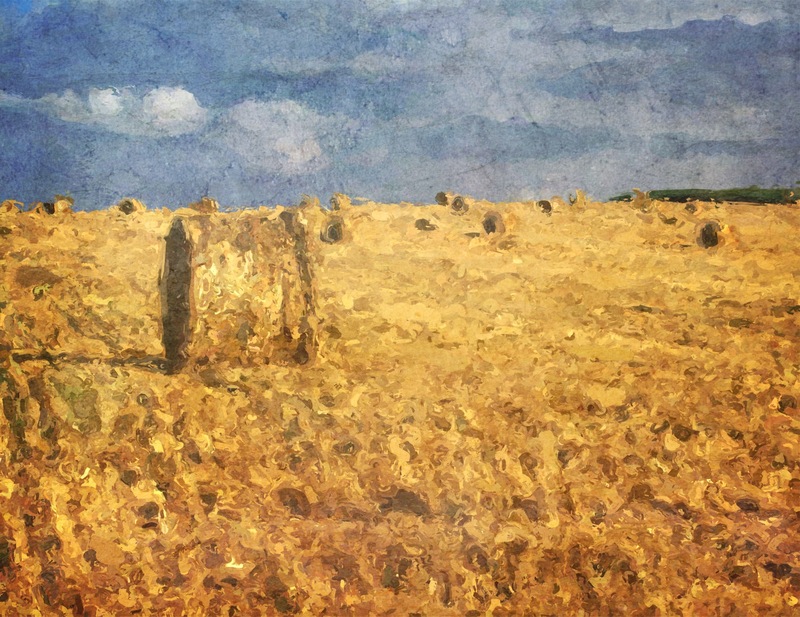 Like this fortnight’s Two Cents Tuesday Challenge theme – Harvest – we reap what we have sown. Last week, Across the Bored asked – “How do you see harvest at this time of year?” – Pumpkins sweet and squash to eat, family near,the holiday blear, pilgrims and the past or things that don’t last, falling leaves or the hopes we retrieve … We would love to see your vision. I especially love those moonbeams – thanks for your entry! The excerpt from above “the romantic in us longs to be out in the country, tromping about in big boots and woolly scarves, kicking around the edge of new-mown fields or just sitting on a fence taking in the glory of it all but we must content ourselves with more virtual views for the moment” is so true. I love autumn, except that where I live, it doesn’t get cold enough to throw on some boots and don a scarf until after Halloween. So, yes, for me the “virtual views” of autumn are about as close to iconic fall images as I will get until about Veteran’s Day. Nevertheless, I have faux pumpkins scattered around the house as decoration. Faux are almost better than real – nature has its way with a pumpkin if you leave it in the house too long! Oooh, I’m familiar with the Palouse your reader Rusha mentioned–went to college in E Wash. Absolutely love this painting. Reminds me of the Palouse area of eastern Washington state from which we have just returned. All golden with soft blue skies! Thank you – This type of vista is so appealing to many of us in so many ways… can’t you just smell it and feel the sun on your skin?